PT Bank Tabungan Negara (Persero) Tbk - PT Bank BTN (Persero) Tbk (IDX:BBTN) hereinafter referred to as "Bank BTN" is an Indonesia state-owned banking company with a core business in mortgage loans sectors. Bank BTN is majority owned by the Government of Indonesia. At present, Bank BTN is 60.03% owned by the Government of Indonesia and 39.97% by investor and public shareholders. Bank BTN is based in Jakarta and now has 860 working units spread across Indonesia (as at the end of December 2015). Its working units comprising of 3 regional offices, 65 branches, 223 sub branches, 479 cash outlets, 50 sharia outlets, 39 priority outlets. Bank BTN also supported by 2,951 Post Offices, and 1,830 ATMs. In term of financial positions, Bank BTN showed a positive financial performance in 2015. According to PT Bank Tabungan Negara (Persero) Tbk Analyst Meeting - Business and Financial Performances as of 31 December 2015 as quoted by JobsCDC.com, Bank BTN recorded a growth of 18.83% in total assets amounted to Rp 171,808 billion over the previous year (Rp 144,582 billion in 2014). Total net profit went up by 61.57% from Rp 1,146 billion in 2014 to Rp 1,851 billion in 2015. Male/Female, not older than 30 years old. Minimum requirement of Associate Degree (D3). Fresh graduate from any disciplines. The candidate with technical background and experience in marketing is preferred. Good looking, friendly and energetic. Minimum height of 155 cm (Female) and 165 cm (Male), proportional weight. JobsCDC.com now available on android device. Download now on Google Play here. Please be aware of recruitment fraud. The entire stage of this selection process is free of charge. 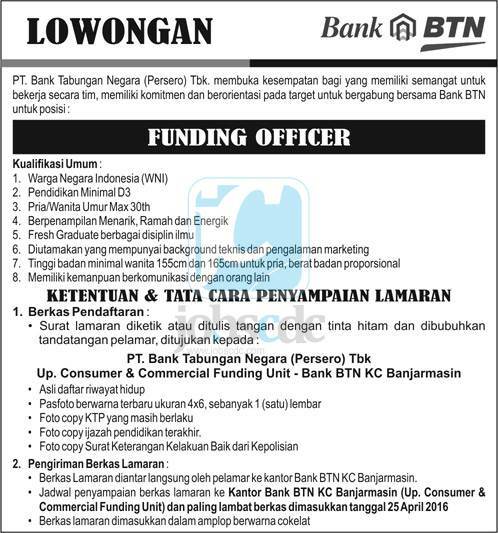 PT Bank BTN (Persero) Tbk - D3 Fresh Graduate Consumer and Commercial Funding BTN April 2016 will never ask for fees or upfront payments for any purposes during the recruitment process such as transportation and accommodation.